Are you tired of trying to figure out the best way to learn to ride a motorcycle? Not quite sure if you want to take a motorcycle riding course at the dealership? If you just want to know the facts about motorcycles and need some help figuring out how to learn to ride, then you’ve come to the right spot. 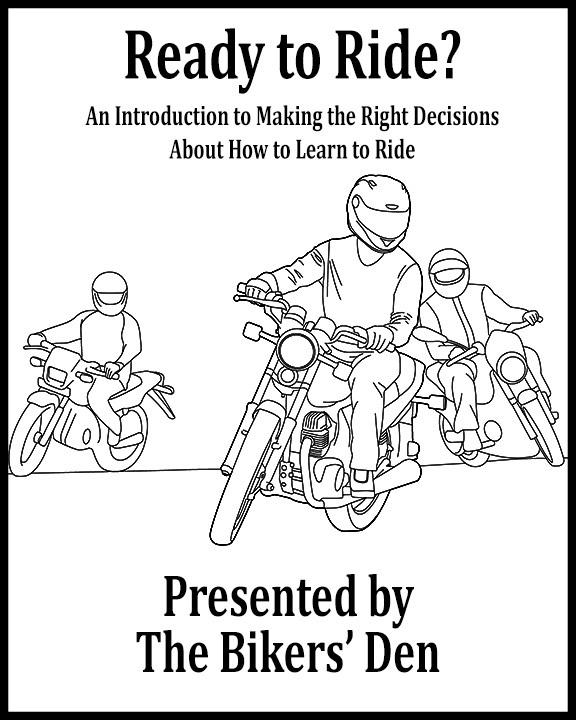 The Bikers’ Den put together an easy-to-understand ebook, Ready to Ride, that gives you the basics of learning to ride a motorcycle without a bunch of sales talk. Sure, we love Harleys and big V-Twins, but we still have a soft spot for Sport Bikes and Cruisers, too. So whether you think you’d be more at home on a Road King or a Katana, Ready to Ride gives you straight talk about learning to ride a motorcycle. What kind of motorcycle am I going to ride? How does the bike actually work? Where do I even start to learn to ride? What equipment do I actually need? Sure, we see plenty of companies out there – even the dealerships – want to charge people to get this kind of information, but the truth is that riding is all about personality and being comfortable with the bike. Knowledge is power and at Bikers’ Den, we want you to have it! Enter your name and email address below to receive your free copy of Ready to Ride. After you submit the form, we will email you the download link and a password to open the pdf e-book.